Wait, Did I Write That? The tag under the title is, “A gluten-free survival guide.” (Yet, gluten intolerance itself, apart from celiac disease is very serious…also – and NEITHER are a fad.) I decided to spend my money on books that might have more insight into medical journals, tests and information. That really bothered me, since that seems to be an issue for so many people, so I was hoping she was going to give people tips to help them get answers… so people don’t suffer for years on end being told “something” (fill in the several of the over 300 symptoms) is in their head. Well my curiosity got the best of me this weekend… I was picking up some books at the Christian bookstore and her book caught my eye again. I had avoided it, thinking it was maybe more commercialized, or maybe pridefully I thought I couldn’t relate to her and this “fad diet book.” Maybe… I thought, no NEW information existed in this book…. However… not all books have to just be medical journals. Sometimes it’s nice to have someone to relate to. The people I feel the MOST comfortable sharing with, are the one who are in the same boat – and understand what it’s like to feel like garbage, and try to hide it. What it feels like to know where every toilet is on a trip, and deal with the anxiety of not knowing what to eat when away from home and pretend to just be “normal”… whatever that is. Although, her symptoms didn’t start until she was in her 20s, much of it was spot on for my struggle. Including trying to figure out a medical diagnosis with affects on multiple systems of my body. Doctors just kept trying to put her on medicine, treating symptoms and nothing seemed to really help her whole body. Finally, while on the reality show, Survivor, in the middle of no where (and away from carbohydrates and preservatives) she felt better than she had in years. She took note, and began a more conclusive search for health when she returned to the states. I’m fast forwarding a bit, but she ended up in contact with Dr. Peter Green, who wrote Celiac Disease, the Hidden Epidemic in 2006. Dr. Green was one of the first to come to the US with the message that celiac disease isn’t as rare as medical schools were teaching. In fact, it was quite common, but was often missed. While this book is no longer completely current, it has some great information in it. Dr. Green now admits to adding the madness of ignoring those with non-celiac gluten sensitivity issues, which – left untreated, are extremely serious as well. Together, Hasselbeck and Green figured out, for her – it was celiac – through process of elimination and realizing symptoms of vitamin deficiency issues, along with genetic testing for the human leukocyte antigen (HLA) testing for the DQ2/DQ8 genes. So basically, all of that to say – her celiac panel was negative, and her endoscopy and small tissue biopsy were both negative for celiac… Yet, she has celiac disease, and her Dr. knew it. Wait. I thought experts said that doesn’t happen? YES, it’s true. It’s highly possible. The fact that she’s famous apparently makes it more believable? I really wish THAT would have been more of the forefront of her discussion with Dr. Oz… but it’s almost like doctors don’t want that brought to light. Does it reflect poorly on them, or just the broad spectrum and difficulty to figure out the disease? However, if YOU have been through things – like Elizabeth, than you’d know you had FINALLY discovered what was making you sick – and you would feel confident in that answer. There is only one “cure” for gluten intolerance, and celiac disease … gluten-free for life. Most recent medical publications being shared publically focus on the flaws in testing, and issues of trying to diagnose, at hand – but that still leaves quite a burden on the patient to “present their case.” To “prove” they are sick? In what other disease do you have to PROVE your illness? Exactly. It’s crazy… but even with the huge number of symptoms I had, no one around here could tell me that was good enough to go onto genetics testing since I had been gluten lite for a year, and gluten-free for a several months when I had my upper/lower GI. I don’t know of many doctors who would appreciate a patient diagnosing themselves, I’m sure if I were a doctor – I think that would be highly irritating. However, it seems like a good reason as to why the numbers of diagnosis are so low. People are tired of being told “nothing is wrong”… only to realize they can heal their body with the proper food. YOU SHOULDN’T BE CONSUMING GLUTEN, IT WILL LEAD TO ANY NUMBER OF DETRIMENTAL HEALTH ISSUES FOR YOU. Anyway, 5 stars from me. I’m only half way through the book, and although just recently released – some of the information is already a little out of date. Things are changing quickly folks… I hope soon they have the ability to NOT make someone go through 10 endoscopies to understand they shouldn’t be consuming gluten. 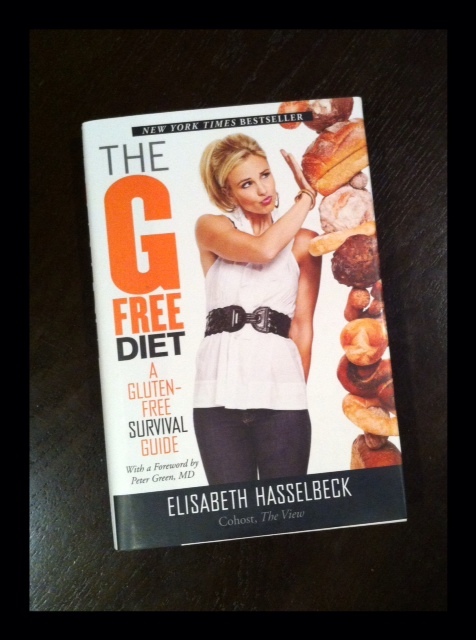 Posted on August 1, 2012, in Celiac/Gluten Sensitivity, Our Struggles, Truth and tagged celiac disease, Elizabeth Hasselbeck, Elizabeth Hasselbeck's book, G-Free Diet, gluten intolerance, gluten sensitivity, healthy for him, Non celiac gluten sensitivity, non-celiac disease, The View. Bookmark the permalink. Leave a comment.